Robin Hood Prince of Tweets Pokies - Regular Spins or Super Bet? Sherwood Forest Like You Have Never Seen It! There is a lot to like about the story of Robin Hood. Stealing from the rich to give to the poor, Robin and his band of Merry Men lived in Sherwood Forest. Their story has featured in books – and in many movies. NextGen Gaming have taken this story and added an element of humour. The Robin Hood: Prince of Tweets pokie features a red-breasted robin as the main character. This is a beautifully produced gambling machine. The symbols spin over a forest background, while medieval style music plays. You can choose to enhance your winning chances with a ‘super bet’ system, which adds extra wilds to the base game. When the free spins kick in, those wilds can replicate over all the reels. Regular Spins – or Super Bet? On the left of the reels, you’ll see a colourful scroll. At the bottom, it says ‘Super Bet’. Above this you will see the higher paying symbols from the game. The base setup sees only the princess symbol highlighted. Above this are the treasure chest and money bag. At the top the scroll, dagger and target symbols are grouped together. You get to choose which of these symbols will turn wild when they appear adjacent to the Robin wild symbol. The more symbols you choose, the higher your spin cost. The balance is between giving yourself the potential for blocks of up to nine wilds in the middle of the screen – or spinning for less. The game is definitely more exciting when you add all the symbols! Robin only appears on the 3rd reel. This outlaw bird will blow his horn whenever it lands. You will then see gold swirls over the adjacent symbols you selected – before they turn wild. One small gripe is that this sequence happens whether a win is possible or not, sometimes slowing the game down. Castle symbols will trigger the bonus any time three or more hit the reels. When you get two of them, the forest is bathed in a glow of sunlight, and the remaining reels speed up. You get 15 free spins, with an extra feature which gives you plenty of big win potential. Wild Robin symbols still appear only on the 3rd reel. These will still turn adjacent symbols into wilds, based on what you selected from the ‘Super Bet’ menu. The extra is that those wilds then turn their adjacent symbols wild. For example, if you have four symbols wild the first time, these might be touching four more on reels 1 and 5. This can give you big coverage of wilds on some spins. Robin appears often enough that you should get at least a few of these extras during your free spins. If you get three more castle symbols, you get even more spins added to your total. 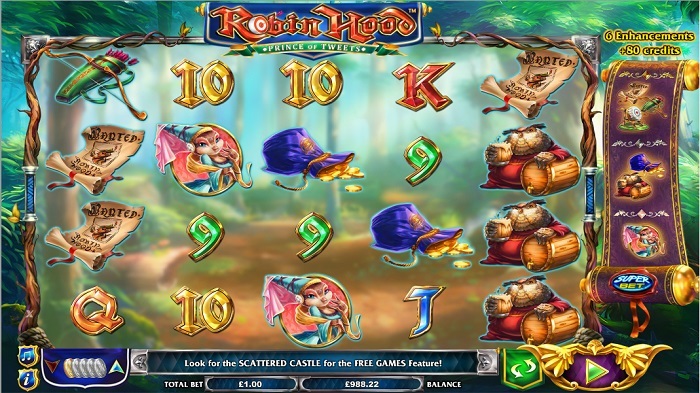 Robin Hood from NextGen Gaming has 40 win-lines, over a regular 5-reel, 4-row setup. It is mobile friendly, with a large spin button on the right of the reels. This doubles up as a bet sizing button. Clicking the coin will reveal a slider. The Return To Player is higher (96.96%) if you choose the full ‘Super Bet’ and only 93.38% without this. Robin is the highest paying symbol. You can only make wins with this during the free spins game. Next comes the princes, then the bag of gold and chest symbols. Higher-paying symbols are completed by a target for arrows, a dagger and a wanted poster/scroll. Playing cards symbols are used for the smaller wins. Another beautifully produced game from NextGen. The reels are transparent, with the symbols appearing to spin right over the pristine forest behind them. The symbols are 3D and detailed. They are drawn in a cartoon style. Plinking Medieval music plays while you spin, and there are plenty of small animations and effects to keep the scene lively. Is this Robin Hood Pokie Worth Tweeting About? In some ways, the humour of the theme is subtle. Other than the bird Robin Hood symbol, there are no further references to it. Overall, this is a stunning online pokie machine. The transparent reels and animations come together really well. I recommend the super bet. Not only does this make game-play more exciting, it increases your overall returns.